Joed Viera/Staff Photographer Lockport, NY- Duty, courage, honor, valor and service are chiseled words between the names of the heroes engraved on the veterans memorial that stands outside of Niagara Hospice. 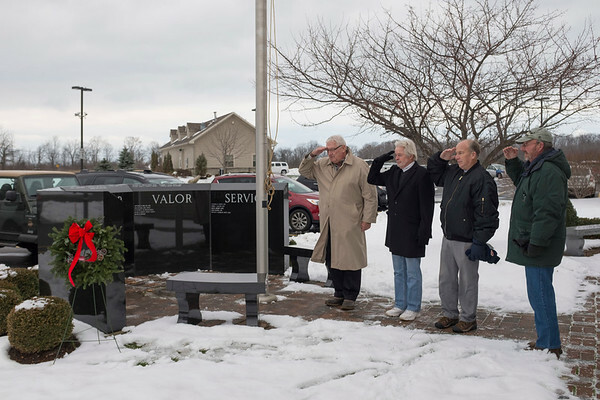 Members of the Vietnam Vets of America Niagara County Chapter 268 Denis Devine, Tom Heary, Doug Torrey and Gordon Bellinger are pictured saluting after placing a holiday wreath on the memorial. Bellinger ended the annual ceremony by anchoring down the wreath after delivering a short prayer “To our past veterans with this holiday wreath may it say to those who have served our country before and with us: thank you, bless you and rest in peace"